The main part of Mount Heng is located in the southeastern part of Hunan Province, China. Mount Heng is 38 kilometers long and the widest is 17 kilometers. More than 200 temples stands around the mountain, witnessing its history and it's one of the Five Great Mountains of China. With the main part in Nanyue District, Hengshan County and east Hengyang County, Mount Heng has the main peaks of Huiyan Peak, Zhurong Peak, Zigai Peak, Tianzhu Peak, Yuelu Mountain and Shilin Peak. Zhurong Peak is the most tallest peak with a height of 13,00.2 meters. Zhurong Peak was named after our ancestor - Zhurong (Zhurong is a family name). Legends tell that Zhurong taught locals how to set fire to cook food and how to use fire to keep insects away for health. ​In order to worship Zhurong, locals in the ancient times built a temple on the top of Zhurong Peak. The 1,500 years old Yanfeng Temple is located on Huiyan Peak. Eminent monk in all ages have preached in the temple. On Shilin Peak, there were Yuqing Taoist Temple, Guizhai Stone, the Thunder God Well, Yudan Spring and so on in the past. Nowadays, only the Thunder God Well is preserved there. The 300.8 meters tall Yuelu Mountain merges Buddhism, Taoism with Confucianism. The well-preserved Yuelu Academy acclaimed as “the No. 1 among the four best academies in the ancient China” has stood at the foot of Yuelu Mountain for more than 1,000 years. On the hillside of the mountain is Gulushan Temple. As the center of Buddhism in Hunan, the temple is more than 1,700 years old. Buddhism in Hunan originated from the temple as well. In addition, Mount Heng is home to various and rare flora and fauna, including golden orchid, changnienia amoena, Gleditsia vestita, Bretschneidera sinensis, cephalotaxus oliveri, pentaphylax euryoides, and hundreds of species of wildlife, such as cabot’s tragopan, Chinese bamboo partridge, Golden Pheasant, dwarf musk deer, zibeth and pangolin. 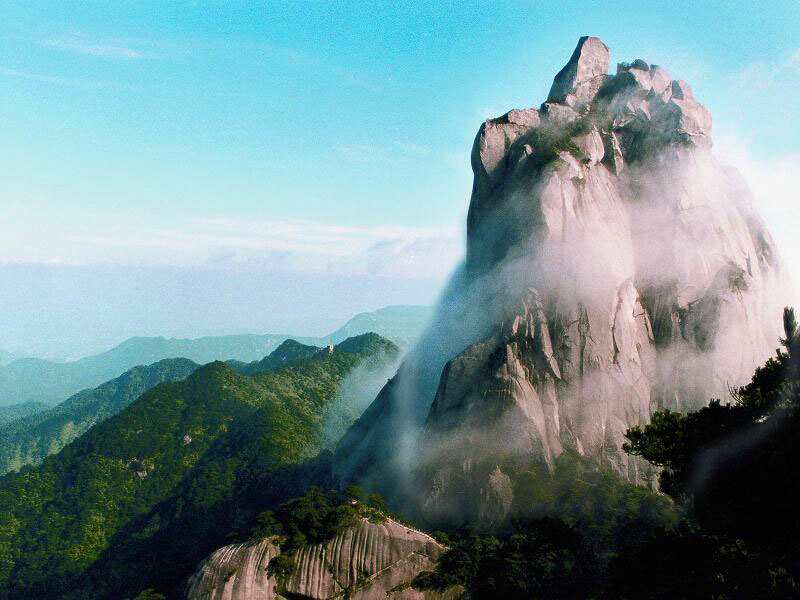 The best time to visit Mount Heng is from August to October. It is cool around Mount Heng with green vegetation. If you are planning to visit Mount Heng for photography purposes, the best time to visit is in the early morning for the sunrise and clouds and in the late afternoon for the sunset. With the development of the railway and high-speed train in China, there are several options. Rent a vehicle from Hengshan County or Hengyang to Mount Heng. This is the quickest and most direct option. Take a train from Guilin, Hengyang, Wuhan, or Changsha to Hengshan Train Station. Then, take a bus to Mount Heng. As at 4th July 2018, for Mount Heng, entrance pricing is 120 CNY per person; children under 1.3m (1.3m not included) and the elder above 70 years old (70 years old included) are free of charge; entrance pricing for children between 1.3m (1.3m included) and 1.5m (1.5m not included) and the elder between 60 years old (60 years old included) and 69 years old (69 years old included) is 60 CNY per person. As at 4th July 2018, entrance pricing to Yuelu Academy is 50 CNY per person. If your conditions are not for climbing (it takes 5 - 6 to climb up to the top from the foot), it is recommended that you climb to the hillside to take the cable car to the top. If you take a bus or taxi to Mount Heng from Hengshan County or Hengyang, please let the driver know that you will get off at Nanyue Hengshan Scenic Area (南岳衡山风景区). If you say “Hengshan”, they may misunderstand that you want to get to Hengshan County. Interested in visiting Mount Heng on a Tour? Wendy Wei Tours offers a variety of different packaged tours as well as custom tours including Mount Heng, among other attractions and destinations. To find out more, please visit our Tours page or Contact Us directly to find out more.